Crab patterns often start to unfold when a market is making its highest high or lowest low in an established trend. These harmonic structures can forecast strong reversals which a trader can exploit with a cautious setup. This article describes a lower-risk system for trading crab reversals using Fibonacci ratios for entry and exits. The crab resembles the butterfly in appearance. It was first described by Scott Carney as a variant of that pattern. Like the butterfly, the crab is an XABCD structure. Although the appearance is very similar, the subtle difference between patterns is down to the alignment of reversal points. 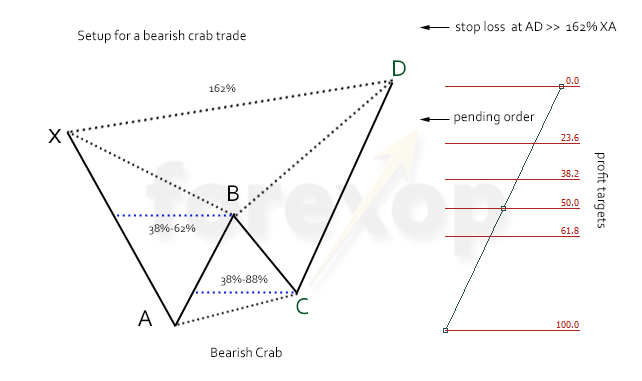 In a bullish crab, point A is the pattern-high and point D the pattern-low. Like the butterfly, a strong bullish case should have point D reaching a new recent low. For a bearish crab, it’s the opposite. Look for point D breaking a new recent high. If the crab pattern completes, expect the price levels A and D to turn into strong lines of support and resistance. In a crab the retracements between A, B and C can be elastic whereas in a butterfly, the retracement at C is elastic but B is fixed. The other essential feature of the crab is that the point D should retrace a fixed distance and that should be 1.618 of XA, the first leg in the pattern. The above means the corrective retracement at B can be much shallower in a crab than a butterfly. But the point D should make a deeper high (or low). These subtle features make a crab pattern harder to identify, especially when surrounded by a lot of market noise. The center of the pattern is what’s referred to as an AB=CD structure. In Elliott wave analysis this should correspond to the last part of the impulse wave in the trend. After recognizing a crab pattern, the next step is to plan a trade entry and exit strategy that will include careful consideration of stop loss and take profits. Look closely at the completion, or anticipated completion, of the pattern to point D. This will define the entry and exit points for the trade. In a bearish crab, as well as producing a 162% XA retracement, confirm that the price at D makes a new recent high. Point D is in the potential reversal zone (PRZ). The price action here is prone to higher than average volatility. Momentum here shifts from bullish to bearish but direction is temporarily undecided. In the analysis use tools including moving average lines alongside candles to look for evidence that the market is reversing. In harmonics trading there should by necessity be some flexibility around the ratios. Always allow leeway, especially around the 162% retracement at D which lies in the PRZ. Crabs can pinpoint strong reversals. The best way to capture the fullest extent of the move is to use a ratcheting stop and take profit. 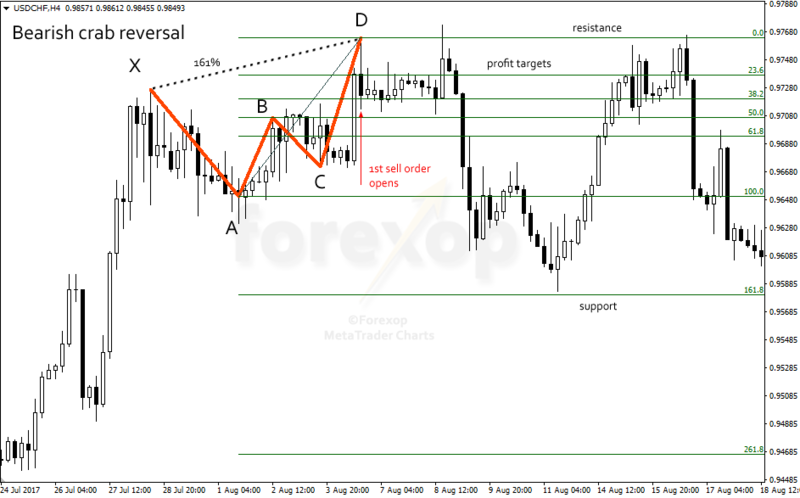 If the price reaches the profit target, move both the take profit and the stop loss down to the next fibo level. Set the pending sell order to open somewhere around the 23% retracement zone – ideally just before. Anticipate raised volatility and chance of new reversals near that level. If a reversal does happen the market should subsequently break strongly in one direction or the other. The stop is placed above D. A strong upside break at this time will be indicative of a failed case. If the sell order has already fired, the stop loss should catch the upward break and close the position. If the market moves higher at this time, well past the 162% line at D, the bullish trend most likely has further to run. If the bearishness takes hold, keep accumulating into the position. While risk limits allow, add new orders as the trend develops and moves through the lower fibo retracement levels. For example, when the price reaches the profit target on the first order, place the next order and so on. This trading strategy is easier on longer range charts, like daily or weekly, when you can watch the action unfold. In shorter time range charts, it’s easier with automation because it is easy to miss the moves which can be very sudden. The chart in Figure 3 shows a complete example of a bearish crab reversal. We place the first pending sell order when the price initially approaches D. This anticipates the pattern completing. We use a short expiry time so that if the market rallies, the sell order expires without executing. The sell order opens before the first profit target at the 23% fibo retracement zone. The take profit is set at either the next or next but one fibo zone. This will be the 38% or 50% zone (see chart). The stop loss is set above D. In the chart example the price rallies again and retests D. But resistance stops the rally and the price falls lower. This kind of retesting is highly typical of reversal patterns. This is why it is best to set the stop loss not on a level with D, but somewhere above to allow a decent margin for breaks in the resistance as well as spreads widening. Otherwise there’s a strong chance of the order stopping out on a price spike. When the price reaches the first profit target, the target is moved to the next level down and the stop loss is trailed lower as well, usually by the same distance. If the bearish reversal looks valid, as in the example, the position size is increased by the same process; by entering sell orders into the falling trend by the same process. The system for trading a bullish crab reversal is virtually identical but just done the other way around. 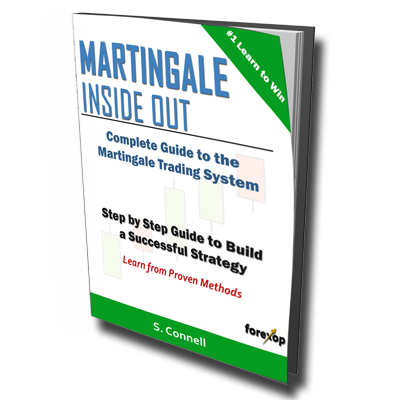 Look for bullish reversals in a falling trend using the same ratios for the pattern, the profit targets and stop losses. Place the pending buy orders to catch the expected bullish reversal. Then pyramid into the position if and when the bullish trend unfolds and risk limits permit.